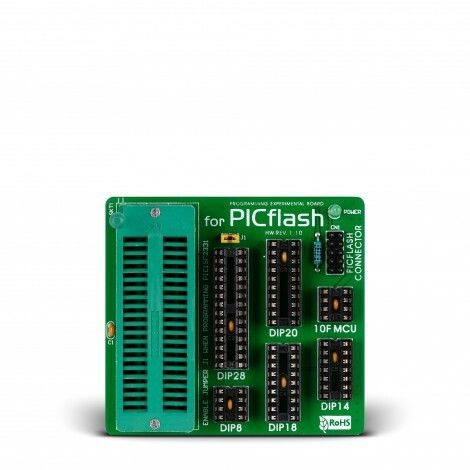 The PICFlash Experimental Board makes the process of programming MCUs easier. There are 8-, 10-, 14-, 18-, 28- and 40-pin DIP sockets provided on the board. There is also an on-board 40-pin ZIF Socket for easy handling of microcontroller. The PICflash Experimental Board will give you an exceptional ease of programming microcontrollers. It features 8-, 10-, 14-, 18-, 28- and 40-pin DIP sockets. The board can be easily connected via IDC10 connector. There is also a 40-pin ZIF Socket for easy microcontroller handling. When the programming procedure is finished, you can pull the microcontroller out of the adapter.